So you’ve decided to sell your own home in NYC. Congratulations, but where do you start? Here are 5 things you will need to ask yourself if you’re serious about going the “for sale by owner (FSBO)” route. Do I Have Enough Time to Conduct Showings and Manage Inquiries Myself? Do I Have a Solid Understanding of the Real Estate Market and How Transactions Occur in NYC? Am I Confident I Know What My NYC Apartment Is Worth? Am I Comfortable Negotiating Directly with Brokers and Buyers for My Home? Do I Know How to Engage Buyers Represented by Agents in NYC? Another issue most FSBO sellers don’t anticipate is the amount of fake showing requests by agents they’ll receive. What Is an Agent Assisted FSBO? What Are Common FSBO Seller Mistakes to Avoid If You Want to Sell Your Own Home in NYC? Should I Use the Same Agent If I Need to Sell My Home Before I Can Buy a New Home in NYC? Most FSBO home sellers are too optimistic about the time they think it’ll require to complete a real estate transaction. While they’ll anticipate some of the more obvious time requirements like having to be available to show the property (e.g. often times foreign buyers of NYC property may only be in town on one day) and respond to and manage inquiries (e.g. emails and frequent phone calls at all hours of the day), they don’t expect some other factors that will surprise them in terms of time commitment. One thing they typically don’t expect is the sheer volume of phone calls, especially from brokers purely looking to solicit them as a listing client, at all hours of the day. It can become tiring to have to repeatedly tell brokers giving you the same pitch that you aren’t interested in paying 6% commission to sell! Typically, a seller won’t want to hide their phone number because they don’t want to miss any potential buyers. However, the situation is really a dilemma for FSBO sellers as the moment they list their phone number publicly on the internet they will guarantee hundreds of cold calls from brokers looking for a listing client to convert. Once the agent has the home owner cornered in person, the agent will begin his practiced speech and presentation about why the home owner should give up on trying to sell your own home in NYC and list with his brokerage. As you can imagine, this can present quite the headache to most NYC home owners, especially those who have to work full time jobs in an office. Often it is because they are not able to consistently take time off work and conduct showings during the day that home owners decide to give up and choose an real estate listing agent. What if the home owner’s building doesn’t allow open houses? The home owner is in even more trouble, as they’ll have to do each showing individually. A slightly better option is to hold an open house by appointment only if the building allows it. It basically means visitors have to sign up for a specific time (usually 15 minute windows) during the block of several hours of the open house. The owner will then receive the visitors and conduct showings one by one over the course of the open house by appointment only. Alternatively, you could even have private showings scheduled for the same time to be even more efficient. It might even create a little bit of the competitive atmosphere that open houses can generate! Fortunately for those looking to sell your own home in NYC the process is considerably easier with the help of an experienced real estate transaction attorney. New York City is unique in that brokers do not do any of the paperwork related to contract negotiation and transaction closing unlike other states. For example, in California the closing documents are all standard and the Realtor typically shepherds the home owner through the deal documentation. In New York City the broker is typically only responsible for matching up the buyer and seller on a mutually acceptable offer price and general deal terms. When it comes to buying a coop in NYC, real estate agents do more work by helping the owner screen board packages (and prepare co-op board packages if they’re representing a buyer). In terms of everything else after the handshake in price, in New York City it’s the real estate attorney who will handle it. Considering that the average attorney fee ranges from $2,000 to $5,000 compared to the average NYC broker fee of $120,000 (6% x $2 million average sale price), it’s really a farce how overcompensated NYC brokers really are. If you’re selling a coop in NYC, make sure to thoroughly understand the more complex steps to selling a co-op in NYC and remember to hire an experienced real estate attorney who will be your go to guide whenever you are unsure about what to do next. Feel free to ask us for a referral to an excellent, experienced real estate lawyer in your area, and read our guide on questions to ask your real estate attorney before you interview them! This is really one of the few advantages to listing with an experienced real estate broker who knows your neighborhood. Many FSBO home sellers have not been following their local real estate market and are usually wildly optimistic with their initial listing price. As a result, they don’t receive a lot of traffic except harassment from junior agents trying to convert them into a new listing client because their listing is egregiously over priced. Keep in mind that not all brokers are created equal. There are over 50,000 licensed real estate agents in NYC and most of them have not closed a deal this year (only 5,000 closed transactions per year so you do the math). Many of them are employed full-time in another profession and know the market about as well as you. That’s why our partner brokers are selected from the most experienced real estate professionals in the industry. All of our partner brokers are in the top 1% in terms of deal experience, typically completing 100 deals or more per year. Furthermore, all of our senior partner brokers come with backgrounds in other more technically challenging industries such as investment banking, management consulting, technology or corporate law. Additionally, as part of our Full Service for 1% listing option, Hauseit will have a brand name, seasoned local agent provide you with a complimentary, no strings attached Comparative Market Analysis (CMA) of your home to help you decide where to initially list your property in NYC. An advantage of using a middleman listing agent in negotiations in greatly underestimated by many FSBO sellers in New York City. Especially if the property is the home you actually live in, negotiations with buyers and buyers’ agents can become very emotionally stressful for you, the home owner trying to sell your own home in NYC. If you are serious about trying to sell your own home in NYC then you need to be certain you will be emotionally unattached and logical in reasoning throughout the NYC FSBO sale process. This means you have to not get upset if you hear criticism of your home from buyers at your open house, and you will have to control your anger during tough negotiations with a buyer. This means that you have to not get flustered by stupid questions and mistakes that first time home buyers will ask and make. In order to sell your own home in NYC you will need to make sure agents representing buyers (especially those wealthy international buyers) don’t avoid your listing because they’re not sure they’ll get paid. From their point of view, it’s completely understandable to only show properties to their buyers listed by another agent with an official co-broke (or offer of commission in an inter-brokerage database). Typically, buyers do not and refuse to sign any sort of Exclusive Right To Represent Agreement with a buyers’ agent. Therefore, why would an agent voluntarily show a FSBO property to their buyer? The risks are just too great to the buyer’s agent. The FSBO seller has a reputation of hating brokers. The FSBO seller may offer a commission on their listing but how credible is that? The FSBO seller may try to go around the agent and contact the client directly. The client could go direct to the FSBO seller once he knows the address. FSBO sellers may be unprofessional or unrealistic in expectations. All of these reasons make it extremely unlikely that a buyer’s agent will consider a FSBO property for their client. As a result, when you try to sell your own home in NYC your listing is usually considered “off market” because most buyers will not be looking at it! Therefore in order to access the over 90% of total buyers who end up being represented by agents, home owners need to try a modified FSBO approach called an Agent Assisted FSBO. 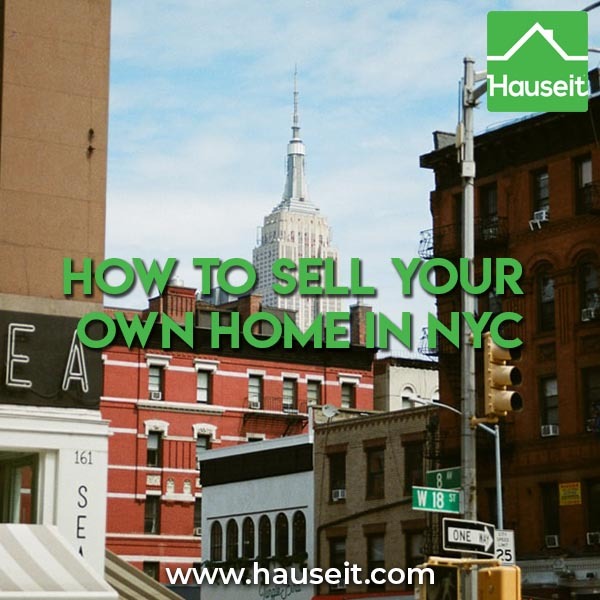 If you’re looking to sell your own home in NYC you need to consider this quasi-FSBO approach if you’re looking to maintain control of your sale, save money and receive the same exposure as you’d have through a traditional real estate agent. 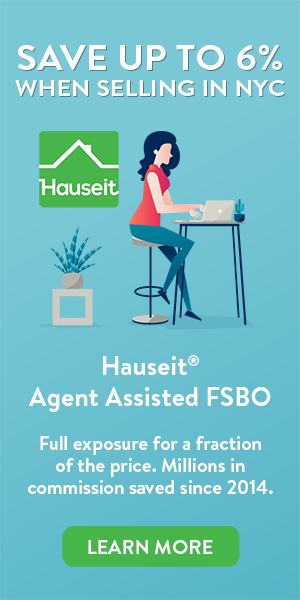 An Agent Assisted FSBO is a flat fee MLS listing by a traditional, full-service broker who doesn’t suffer from a negative reputation among the brokerage community because he does not openly discount commissions. Openly discounting commissions does not and has never worked. The moment a broker gets the bright idea that he might be able to get more business by discounting his commissions is the moment that the wider brokerage community shuns him. Since 90% of real estate transactions in New York City are done between an agent representing the buyer and an agent representing the seller, every broker needs the cooperation of other brokers to get deals done. As a result, for buyers and sellers to truly benefit from discounted commissions, the broker must have an intact, full-service reputation and must not openly discount commissions. This can only be accomplished through a third party marketing and referral company like Hauseit. This is one of the most common mistakes made by NYC FSBO home sellers. Everyone loves their own home but that does not mean you can inflate the listing price for your own emotional well-being. You must take a detailed look at comparable sales, current and in-contract listings in your building and surrounding neighborhoods. You must learn how to price your property through a comparable market analysis and adjust your listing price for factors such as what floor you’re on, whether your unit is renovated and such versus comparable listings which have sold or gone into contract. You may want to consider under-pricing your property versus comparable homes on the market. Why? Because you can without fear of owing 6% to your listing agent as soon as a buyer is found at your listing price. With a traditional Exclusive Right To Sell Listing Agreement, sellers will owe their listing agent 6% commission as long as a “ready, willing and able” buyer is found at their listing price even if the seller decides to back out!1 No wonder traditional agents love to harp on about how important it is to set a realistic initial listing price. They do so because they want the opportunity to find at least one buyer at your price so they can legally compel you to pay them 6% commission! 1Not all listing agreements will have this language. Real estate contracts are negotiable just like real estate commissions are negotiable before signing a listing agreement. Please read our article on can a seller back out of an accepted offer in NYC to learn more! Over 96% of all listings in the city are professionally marketed by a real estate agent. That means almost all of them will have sparkling, professionally done photographs. As a result, most home buyers will know that the photos they see online are likely more flattering than the property actually is. If that is the case, why on earth would you skimp on a $300 investment in professional photography? If you have low grade, low resolutions photos from your old flip-phone camera on the web, what do you think buyers will think when they see your listing? Are these terrible photos what your home looks like on its best day? This is a common, understandable yet still comical error many first time NYC FSBO sellers make. They all eventually realize that most buyers are being led around by real estate agents, and they all eventually start saying that they’ll work with buyers’ agents and offer some sort of commission to them. However, who are you and why would a risk averse buyer’s agent trust you? Buyers’ brokers have no idea who you are and have never worked with you before. All they know is that you’re a random FSBO seller which means that you are probably very cheap and have a distaste for brokers. It’s also extremely apparently to them that there is no FSBO commission agreement or relationship of any sort between you and them. So why would they risk introducing their client to you? There is nothing stopping you from trying to work directly with their client, or worse, their client finding you directly later. A risk averse buyer’s broker would never risk the introduction in the first place! If your home is only listed on Zillow as a FSBO, buyers’ agents may plausibly think it’s spam or an open listing by an agent if their buyer clients bothered to even ask them about it! That’s because no real listing would be only listed on one site which is largely irrelevant for NYC property searches! Absolutely. Not only will you save up to 6% commission on your home sale, you’ll get an additional 1% in a buyer agent commission rebate to you after you close on your new home! Compare that to using the same traditional, full-commission agent on both your home sale and purchase. You’d pay 6% to sell your home, then you’d indirectly pay that agent another 3% in the form of a higher purchase price! Do you really like this agent that much to pay them 9% in commissions? Are they an immediate family member or someone you owe a huge favor to? It is pure insanity to pay someone 9% in combined commissions when you can get the exact same outcome for 1% or a small flat fee. No matter what this person has done for you, you do not owe anyone this enormous of a favor!